I can’t help make a parallel to the company Nakamichi which made the most amazing cassette tape decks during the 1980’s and ’90s. I had the privilege of owning the ‘lower-end’ BX-1 and almost all the music to date on this site (up until 1993) and on the xarrier label was mastered on this thing. 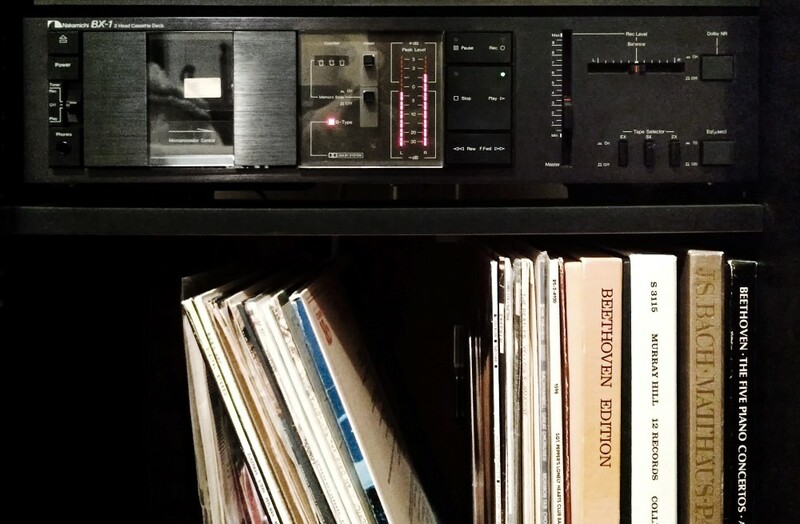 The beautiful paradox of Nakamichi was that the cassette in and of itself was an obsolete medium to begin with – invented for its compactness rather than sound quality, the cassette was doomed to never reach a level of hi-fi of even the vinyl LP. And as the battle for compactness goes, its destiny was pre-determined as a medium that would eventually be negated by the immaterial ether of the digital. Nonetheless, Nakamichi pursued perfection within its damned boundaries: They pushed the limits of the cassette’s sound quality to a level still unprecedented. To this day, I get comments from generous listeners who are in disbelief that vintage works like statik 2 and resonance was mastered on cassette (after being tracked on a 4-track tascam 234 cassette recorder). But as high as Nakamichi flew toward the Icarian sun, the company’s fall was an epic one. When ‘auto-reverse’ was introduced to make cassettes even more user friendly (and to compete with the inevitable mainstream saturation of the CD which could play a whole album without flipping the medium over), Nakamichi went to absurd measures: Because the angle of the tape deck head could not have the correct azimuth when rotated in the standard auto-reverse mechanism by lesser manufacturers, Nakamichi invented the ‘RX-505.’ It was a $1200 beast that would pop out the cassette and rotate it as one would do by hand – but all within milliseconds. Even with these innovations by Nakamichi, few were buying the current products. Unlike today’s digital disposables, I used my deck for a decade because its sound quality couldn’t be beat and because its functionality merged with beauty. After mastering most of the Wept work and statik 3, 2, 1, resonance, animus, and 16:16, the deck finally went through its own ‘Time to die,’ moment with what has been nicknamed ‘Nakamichi Disease.’ The transport rollers prematurely decayed and the machine would spin tape with no traction. Today as analog media makes a comeback from the indie margins, perhaps we can understand Hauer’s ‘Time to die,’ not as nihilistic erasure but containing the weight of a powerful nostalgia that actually gives obsolescence a new meaning.